Fido might have the heart of a lion, but legs like a footstool. 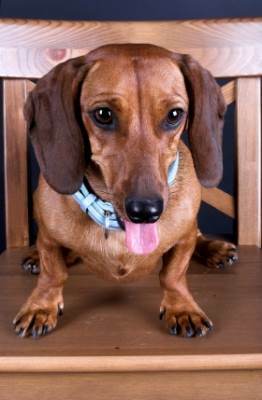 If your pooch is vertically challenged, give him a boost with a dog ramp or steps to help him negotiate a world that is a bit too tall for his diminutive stature. Free dog ramp plans are fully customizable, so you can build the size and shape you need. 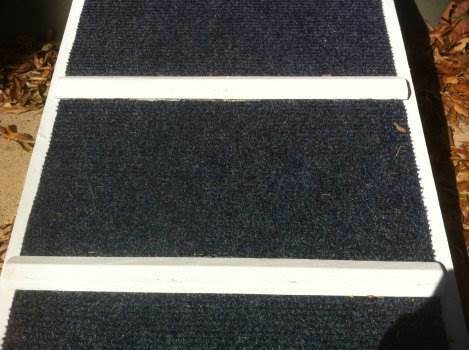 Steps for indoor use can be carpeted to match your home, providing a need luxury for your dog without creating an eyesore. 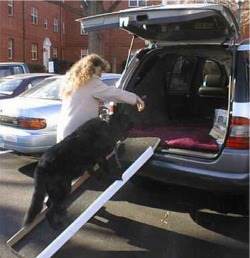 Build a ramp for your dog to enter a boat or trailer, steps to get into a car or even climb on a couch. 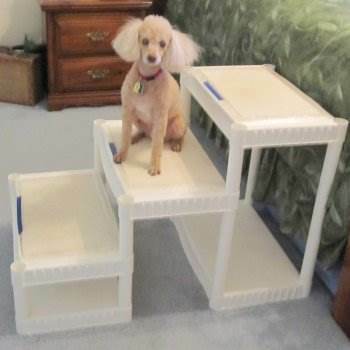 Steps can be built with a hinged lid to provide storage for Fido's toys and are simply built of plywood and lumber scraps. 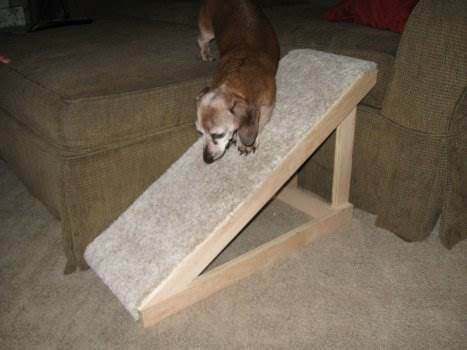 Dog ramp plans are handy for aging dogs that may not have the energy they once had, making life a little simpler for your best friend. 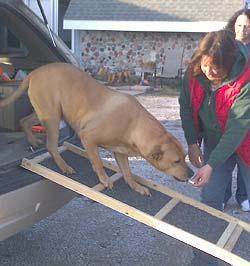 Give your pet a helping hand by building a dog ramp for ease of accessibility to a bed or other furniture. 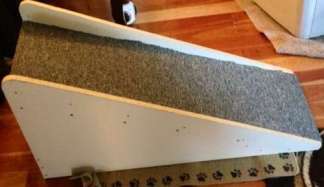 Using plywood and some carpet you can easily build this dog ramp for your pet. 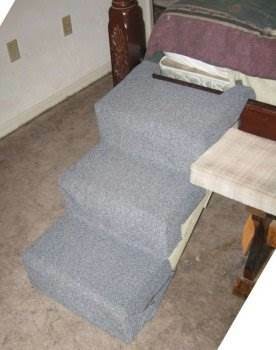 This plan will give you instructions for building dog stairs to help give your pet a needed lift. Easy to follow plans for dog steps that are light weight for ease of carrying. 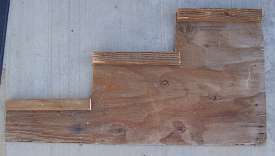 This inexpensive large ramp will cost less than $40 to build out of salvaged wood. This cost effective agility ramp is perfect for your dog shows. This dog walk made from inexpensive wood is perfect for any backyard occasion. These steps are customized to reach heights at an affordable cost..
Build-at-home custom ramp so you don't have to lift your dogs anymore. These plans are so easy to follow you'll have your ramp done in a flash. These simple do-it-yourself instructions show you how to build your own dog ramp at home. 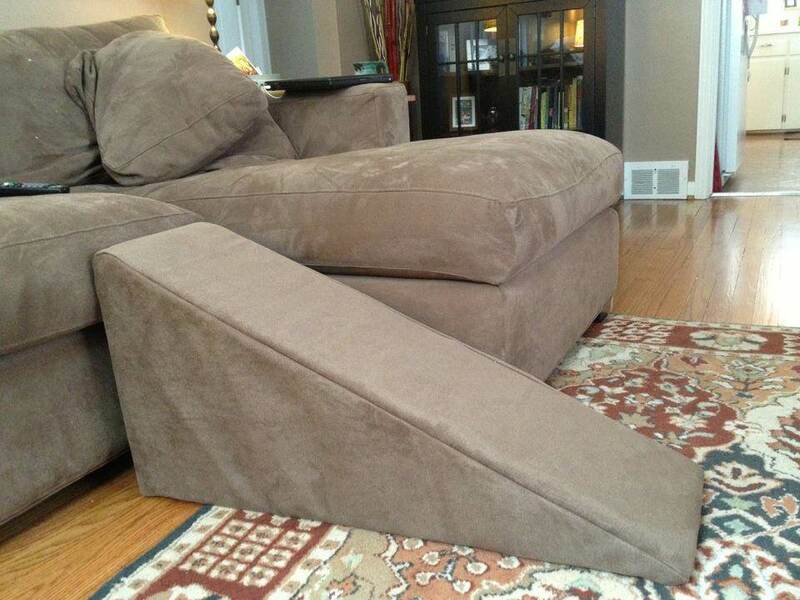 This dog ramp fits right in with your living room furniture and decor. Give your dog exercise and a view with these easy-to-follow instructions. 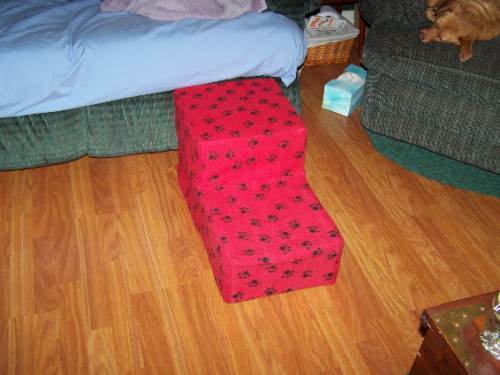 Try out these home-style doggie steps and give access to furniture for your pet. 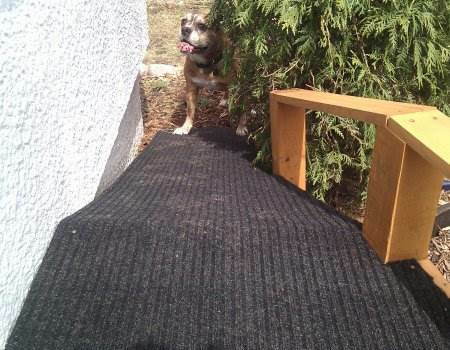 Here are step-by-step instructions on building a beautiful ramp for your dog. 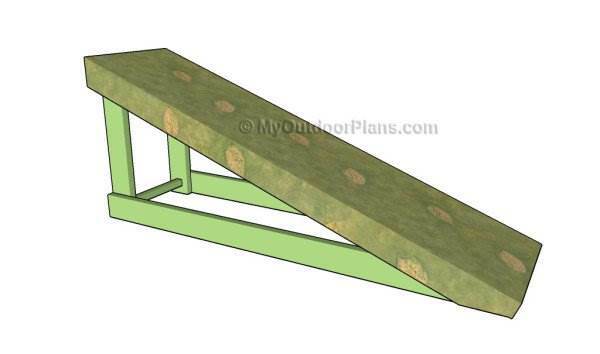 Here are instructions to build a cheap but durable dog ramp. 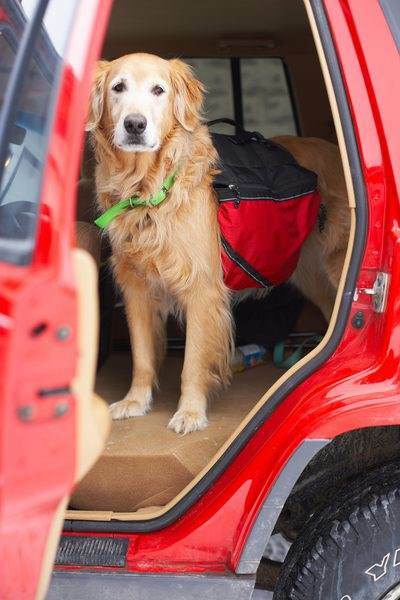 A great project for little cost to give your large dog access to the car. 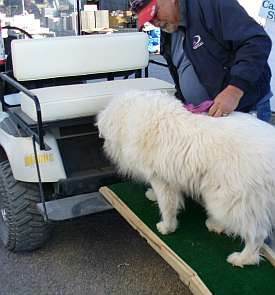 Simple-to-build outdoor pet ramp instructions for a durable, weather resistant solution. These step-by-step instructions show you how to build your own dog ramp for cheap. Have an injured pet? 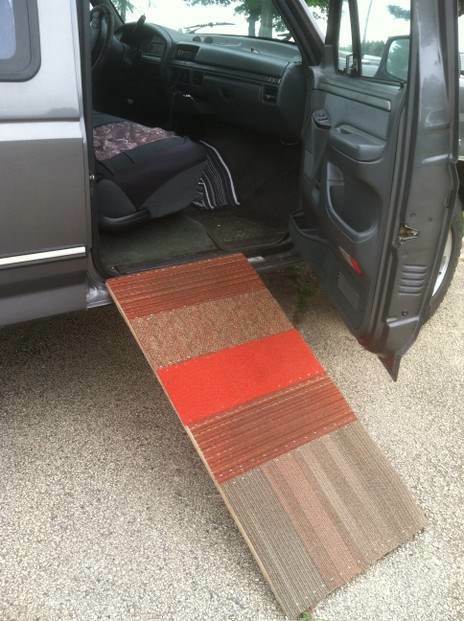 This ramp is a perfect solution for their mobile needs. 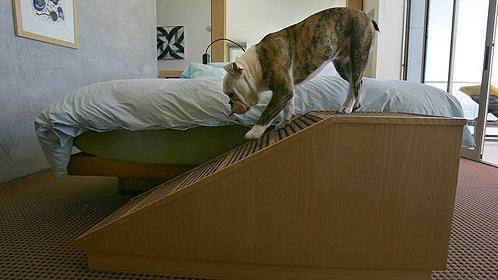 This stylish dog ramp has a platform for Fido to view his domain from. This boat ramp acts as a dog slide for all of their boating adventures. 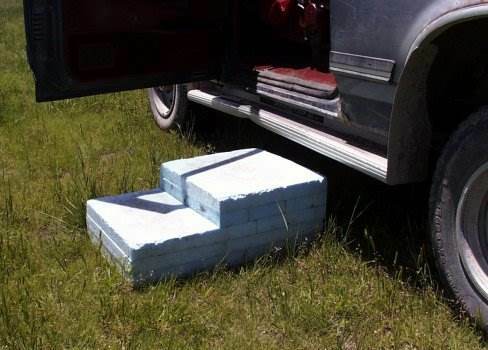 A cheap alternative to a ramp, these lightweight dog steps help your animals reach their highest destinations. 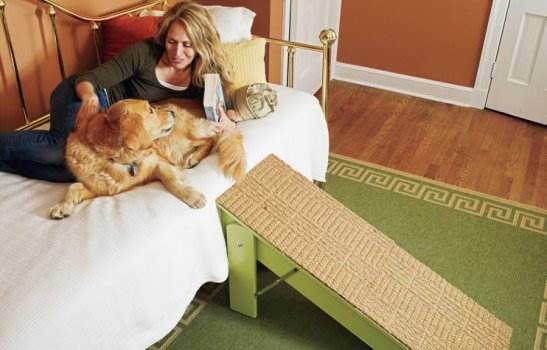 These dog stairs are a proven success for knee-friendly solutions to help your dog climb into bed with you. 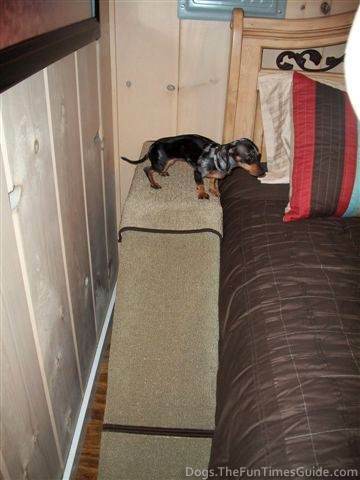 Originally built for a houseboat, this collapsible dog ramp is suitable for most any need. This pet ramp is easy to build from old plywood and boards right from your own backyard. This is a simple, cost effective project which helps preserve your animal's health. 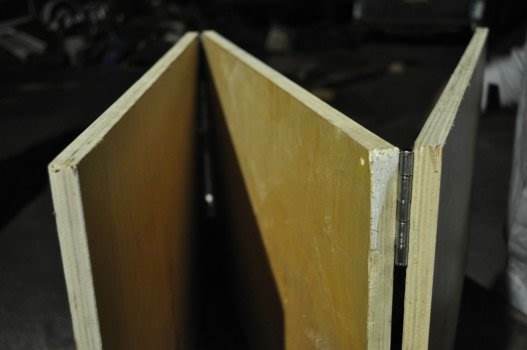 Made from thin plywood scraps from old furniture, this ramp saves your back and your wallet. This project is designed to help your dog climb out of the pool and can be made from materials lying around. Make these doggie steps yourself from assorted material laying around following these simply instructions. This is a bed ramp for dogs you'll be proud to display - and you can build it yourself using your own materials. 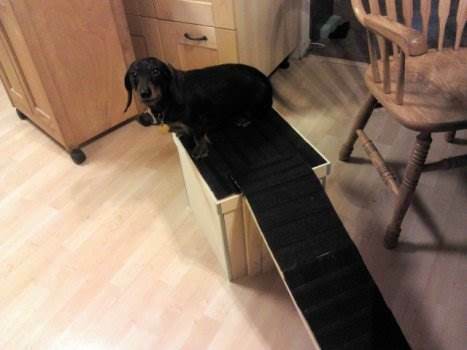 This dog ramp, made from assorted materials, provides a soft padding for their paws as they easily reach higher locations. Purchase a plan if you can't find a free one to suit your needs. Plans include bird feeders, dog houses, bird houses and more.